Happy Sunday! It’s a start of a new week and the start of a new meal planning week! When do you like to meal plan? Whether you do a little throughout the week or just get it done all at once the key is to save time and not to spend more than 29 minutes meal planning each week. If you’ve been meal planning for awhile you probably can meal plan in minutes and the more you meal plan the easier it will get. Keep sticking with it as you’ll see results not only in your pocket book but also saving time making dinner. Today is all about meal prep and prepping ahead. You can save a ton of time prepping meals ahead. After you do your weekly grocery shopping take the time to cut and prep veggies, cut meats like chicken and put in resealable bags and place pantry staples needed for each meal in little bins along with the recipe. The more you can do to prep ahead the easier it will be getting dinner on the table. Don’t feel like prepping all your meals at once? No problem! If you’re not ready to dive into prepping 5 meals at once or don’t have a lot of extra space for containers and bins than the meal for the next day prep the night before. Cut up veggies, marinate meat, measure out as many ingredients as you can. Put all the cold ingredients together in a small bin and refrigerate and collect all the other ingredients and pantry staples for the recipe and put them in another bin. That way you have all the ingredients on hand and ready to go when you’re ready to cook and will save you time looking around for ingredients when it’s time to make dinner. By having it all in a bin or container you have all the ingredients laid out for you to make meal time a breeze! This weeks recipes are all about easy meal prep and meals you can easily prep ahead of time! Making the pesto ahead of time saves time when preparing this meal! You can even make this entire meal the night before, cover with foil and pop in the refrigerator. When ready for dinner just pop in the oven! In a medium bowl mix ricotta, egg yolk, ½ cup mozzarella, Parmesan cheese, parsley, and garlic. Spread ⅓ cup marinara sauce on the bottom of a 9-inch baking or pie dish. Lay lasagna noodles on a large clean surface (wax paper works great) and spread each noodle with 1 tablespoon pesto. Top each noodle with 3 tablespoons ricotta mixture. Roll lasagna noodles and place seam side down in baking dish. Pour remaining marinara sauce evenly on top of rolls. Sprinkle with remaining mozzarella cheese. Heat olive oil in a large saucepan over medium heat. Add remaining ingredients, bring to a low boil then reduce heat to low and let simmer for at least 10-20 minutes. Remove bay leaf. Place all ingredients except olive oil in a food processor or blender. Start blending, then stream in olive oil until blended. Season with additional salt and pepper if desired. To freeze, follow the recipe as directed without baking, then cover and freeze in a freezer safe dish for up to 3 months. When ready to use, thaw in the refrigerator overnight. Cover with foil and cook in a 350 degree oven for about 30 minutes. Uncover and bake for about 10-15 minutes longer until hot and bubbly. This mouthwatering salad is loaded with ground beef, diced tomatoes,Mexican shredded cheese,crushed tortilla chips and tossed in an easy Creamy Salsa Ranch Dressing! Cook meat in a large skillet over medium heat until thoroughly cooked. Stir in taco seasoning and water and cook for a few minutes longer. To assemble salad place lettuce in a large bowl. Add in meat mixture, tomatoes, cheese and additional optional add ins and toss until combined. Before serving toss salad with desired amount of dressing and top with crushed tortilla chips. Mix salsa and ranch in a small bowl or mason jar until combined. You can substitute ground beef with ground turkey or ground chicken or use cooked shredded chicken in place of ground meat! Escape to the tropics with this easy Hawaiian Chicken Skillet that uses a lot of pantry staples that you can set aside until ready to cook! Place chicken breasts between two sheets of wax paper and using a mallet or a rolling pin flatten chicken to about ½ inch thick. In a small bowl whisk ⅓ cup reserved pineapple juice, ketchup, soy sauce, vinegar, brown sugar and ginger until combined. Set aside. Add onions and cook for about 4-5 minutes just until slightly tender. Season each side of chicken with salt and pepper. Add in chicken and cook about 5-7 minutes per side until chicken is thoroughly cooked. Pour in sauce and deglaze skillet, about 1 minute. Add in pineapple chunks and return chicken to skillet, turning chicken to coat with sauce. Cook for 5-7 minutes longer, turning chicken halfway. Remove chicken to serving platter. Whisk in cornstarch to thicken sauce. Pour sauce over chicken and garnish with fresh cilantro. *Flattening chicken breasts is optional but recommended for even cooking. *After I whisk the cornstarch to the sauce in the skillet I usually add the chicken back to the skillet and turn the chicken to coat to smother the chicken in the thick sauce. TIP! Wrap fresh ginger in plastic wrap and in a freezer bag and store in the freezer. Whenever a recipe calls for fresh ginger you have fresh ginger right at your fingertips. Plus keeping it in the freezer makes it easier to mince too! 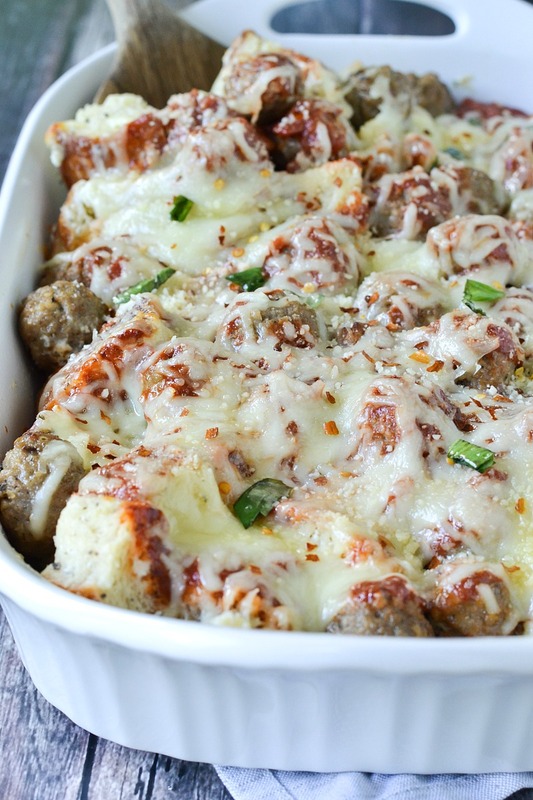 There’s no doubt your family is going to love this yummy Meatball Sub Casserole! You can even lighten it up using turkey meatballs! In a large bowl mix mayonnaise, cream cheese, ½ cup mozzarella cheese and Italian seasoning until blended. Add in Italian bread cubes and gently toss until to coat. Pour bread cubes evenly in the bottom of a 9x13 casserole dish. Add meatballs then top with sauce. Cook for about 25-30 minutes until hot and bubbly. Craving Thai? Skip the takeout and whip up this delicious Red Curry Chicken and serve over white rice ready in about 30 minutes! 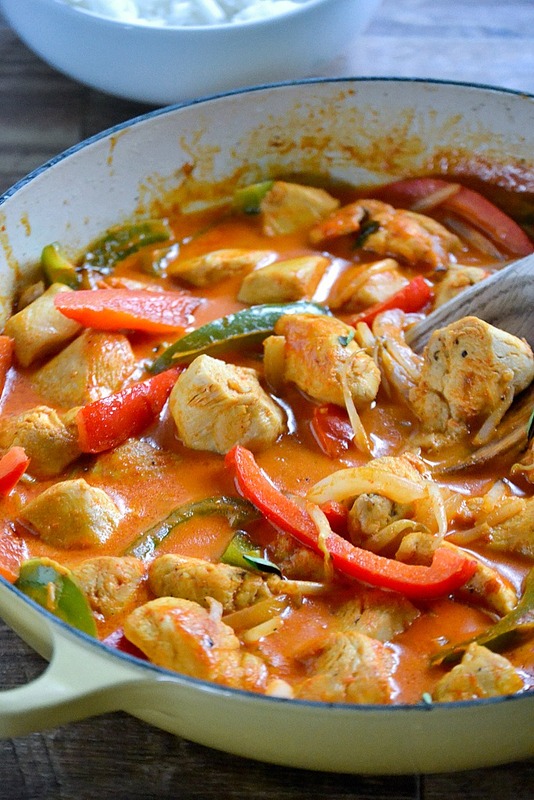 A quick and easy recipe for Red Curry Chicken - ready in about 30 minutes. Cook chicken stirring occasionally until all sides are brown and chicken is cooked thoroughly, about 10-12 minutes. Add in peppers, onion and garlic and cook until slightly tender about 5 minutes. In a small bowl mix together coconut milk, red curry paste and lime juice until blended. Add sauce in with chicken and stir to coat. Bring to a boil then reduce to a simmer for about 5-10 minutes. Season with salt and pepper to taste if desired. Stir in bean sprouts and basil right before serving. Red Curry Paste like Thai Kitchen red curry paste can be found in the ethnic food aisle.